It is closely related to the ‘Esopus Spitzenburg’ apple, (wiki) and is a parent to J’onamac’, ‘Jonafree’ and ‘Jonagold’ apple varieties. In the USA, Jonathan is available in the East and Midwest. It has a thin, smooth and tough deep red skin with yellow to green undertones. The apple size is small to medium. The flesh is fine textured, very juicy and firm, and creamy yellow in colour. It has a crisp bite. The flavour is sweet with a hint of tartness and subtle hints of spice. 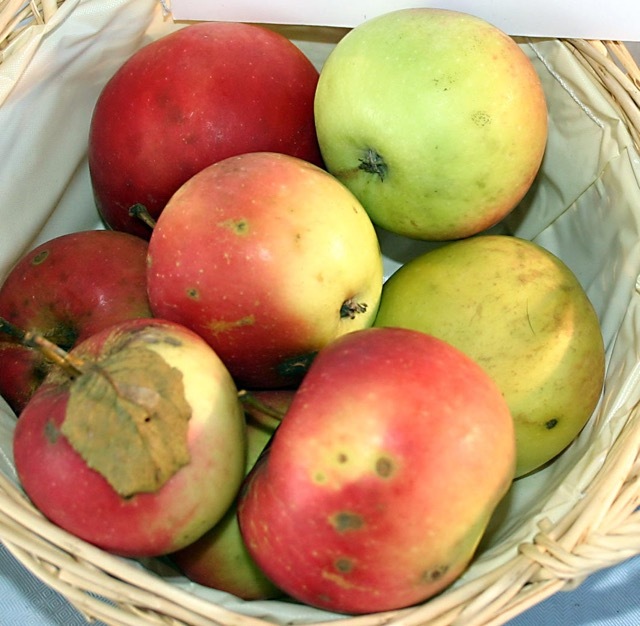 Jonathan apple is great for eating fresh, cooking or baking in pies and making apple sauce. It’s not a good choice for baking whole because it loses its shape. On the other hand, diced Jonathan will add sweetness and moisture to cakes, crisps and bread puddings. It can also be slow cooked to make sauces or caramelized apples. Since it’s juicy, it’s excellent for juice and cider. “You had” what happened to it? I would love to live in an orchard and eat lots of apples a day. I love making apple pie or tart. It’s my most favourite dessert. I made one yesterday and I’m just finishing the last slice. Mmm so good! Omg what a pity. I don’t like snow either, so I won’t blame you. Have a great weekend!